For our 69th Social Mixer on Wednesday 17th April, we have the pleasure of inviting Rebecca Fannin, the Founder and Editor of Silicon Dragon Ventures, to share her findings on technology innovators in Asia. You can find her on LinkedIn, Twitter (@rfannin or @silicondragon) and watch her talks and interviews on YouTube. Doors open from 6:30pm at Bisous, 9/F, LKF Tower, 33 Wyndham Street and we will start the interview at 7:15pm. The entrance fee of HK$100 includes one complimentary drink, high-quality networking and the chance to learn from a well-connected and highly-informed global thought leader. Rebecca is the former international editor of Red Herring and is a regular contributor to Forbes (read her 10 Asian tech predictions here). Having interviewed many leading lights in the Asian tech space, she has also published two books on the subject, Silicon Dragon (2008) and Startup Asia (Oct. 2011). 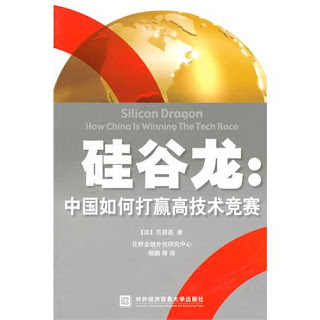 You can buy the Chinese version of Silicon Dragon ((硅谷龙：中国如何打赢高技术竞赛) on Dang Dang. Kai-Fu Lee wrote the foreword to Startup Asia and the book was just published in Chinese by CITIC Press. (Couldn't find the link). "From tech parks in India to half-constructed offices in Ho Chi Minh City, Startup Asia is a splendidly woven narrative of leading entrepreneurs and venture capitalists who are shaping the future that is being invented in Asia and envied around the globe.” Tony Nash, Global Director, Custom Research, Economist Intelligence Unit. “Rebecca Fannin, who caught the early waves of the Chinese Internet boom with her book Silicon Dragon, shows why we now need to be paying attention to VIC (Vietnam, India and China) in her forward-looking book Startup Asia. With diligent on-the-ground reporting and hard-won access, Fannin follows the money — the smart money of VCs who made money on both the U.S. and China Internet booms — to see where we should be placing our next bets in the world of technology.” Gady Epstein, Correspondent, The Economist. Rebecca has generously offered three complimentary tickets to her Silicon Dragon Hong Kong 2013 Event on 18th April in Cyberport at which I will interview Vicky Wu, Co-Founder of Zaozao. Other illustrious speakers include former Web Wednesday guests, Yat Siu, Founder of Outblaze, and Anthony Zameczkowski, Head of Music, YouTube Asia Pacific.